Ian Fleming's non-fiction book 'Thrilling Cities' could be heading to a television series adaptation. According to the Hollywood Reporter, American actor Michael Weatherly ('NCIS', 'Dark Angel') is looking to turn Fleming's travelogue book into a possible TV series through his production company Solar Drive Productions. "All of it is so exciting, but I'm really not allowing myself to get too excited about it until the final episode of NCIS airs next Tuesday," said Weatherly. In 1959, Ian Fleming, the creator of James Bond, was commissioned by the Sunday Times to explore fourteen of the world's most exotic cities. Fleming saw it all with a thriller writer's eye. From Hong Kong to Honolulu, New York to Naples, he left the bright main streets for the back alleys, abandoning tourist sites in favour of underground haunts, and mingling with celebrities, gangsters and geishas. The result was a series of vivid snapshots of a mysterious, vanished world captured in two journeys and published as the 'Thrilling Cities' collection in 1963. 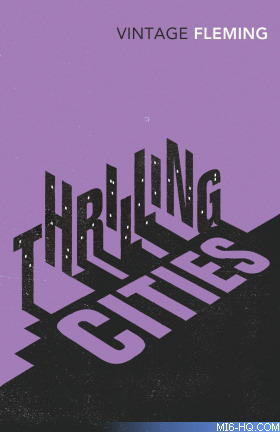 Vintage Classics republished 'Thrilling Cities' in paperback in 2013. BBC Radio 4 produced a three episode series read by Simon Williams and broadcast in 2014.